I was invited to Maine Medical Center for a presentation and introduction on their MRSA and other Multi Drug Resistant Organism prevention program. I read their program/policy online prior to my visit , so I was prepared to be impressed. I was not disappointed. Almost all of the important components of my original multifaceted approach to MRSA prevention, as proposed to the Maine Health and Human Services committee, are in MMCs program. And, they are successful with it. The passion of the presenter was very obvious. His desire to succeed, determination and tenacity with a prevention program has obviously made MMC and the entire region around MMC safer from MRSA and other MDROs. Time, money, staff, supplies, administrative support and all the other necessary stuff of prevention has been made available to MMC. And it has paid off. The graphs displaying increased hand washing and decreasing infections were proudly displayed at todays presentation. And, remember that active surveillance of high risk populations is an integral part of their program. We went to a couple of floors in the hospital to see how they stocked personal protective gear and to also see the number of hand gel dispensers there are. Their hand washing compliance scores for each floor are displayed as you walk off the elevator. We spoke with staff members of both the floors that we visited who participate in this excellent program. MMC has drawn in staff from all departments to participate and promote this program. There is ownership of the program. That is the culture change that is necessary for MRSA control. MMC has a program that they can be very proud of. As in all things Maine related, there are two Maine’s. There is the Portland and Southern Maine and then there is “the rest of the State”. or the other Maine. Remote northern, eastern and down eastern Maine do not enjoy the same resources or support that Southern Maine does. There are still a number of Maine hospitals who do no MRSA screening at all or inadequate screening. And many of these hospitals do have MRSA. I have heard that few hopsitals in Maine do not have MRSA. Is this possible? I don’t think anybody would outright lie about that, but on the other hand, if complacency rules, it is just a matter of time for them to have MRSA. There are high risk patients everywhere. Contrary to popular belief, Mainers do travel outside the confines of their small towns. Also, small town hospitals all refer to larger hospital referral centers, where there is MRSA. So, no hospital is without risk from MRSA. All of this being said. I am very grateful to the representatives of MMC for having this presentation for the MQF, and the others of us who are advocating for MRSA prevention. It was very generous of them to do this. I wish the same standards and passion for MRSA control for the rest of Maine. And I stand strong that Active Detection and Isolation is the minimum standard that all Maine hospitals must use to stop MRSA. That begins with high risk screening and awareness. We have the law and now we must see that it is enforced and quickly. Delay is not acceptable. MMC would not have had to change much at all if my entire legislative proposal had passed. Their program is excellent. But, we all know such standards are not equal in all Maine’s hospitals. I don’t think MRSA prevention and safety for patients should vary between Portland and their entire region and the “other” Maine hospitals. All Maine citizens should enjoy the same level of safety. High risk screening must start now. What drives our hospitals? I am not talking about the hands on caregivers like nurses. NURSES ARE AWESOME!! I am one myself! In general nurses are motivated by their love for and dedication to ill and injured patients. I am talking about CEOs, hospitals associations and professional medical associations. They will tell you if you ask them that their priorities are their patients and excellent medical outcomes. “Care and compassion” are two more words you will hear in their responses. The reality is that filling beds, money, money money and growing their organizations are their priorities. This isn’t to say they intentionally do damage to patients , but they feel a certainty that they are above scrutiny if they do. The other reality is that they lobby to avoid, and limit medical liablity…again money oriented motivation. So, wouldn’t it be something if lawyers took the challenge to turn the tables on MRSA? I know, lawyers aren’t medical people, but……. a class action suit for MRSA infections acquired while under the care of “caring and compassionate” hospitals may be the greatest motivator for improved MRSA prevention. It makes me sad to have these thoughts. But, I have witnessed the mechanisms of medical politics and power first hand. I never thought our medical care would come down to this. It is mind boggling. Our medical care is the fodder of politics from the level of your local doctor and hospital all the way up to the president of the US. Who would have thunk it. In an ideal world, our doctors and hospitals would do whatever is necessary to give everyone the safest and highest quality of care that they can, withholding nothing. When we are sick or injured, we would all expect that, would we not? Well, don’t hold your breath for that! Everyone needs to assert themselves and bring an advocate when they go into the hospital for anything. Your nurses will advocate for you, but they also collect their paychecks from the hospital. This limits their advocacy. Complainers and whistle blowers are not tolerated well in hospitals, even when they are right! Unionized nurses do hold more clout because of their numbers and professional representation. So if you are in a unionized hospital, consider yourself lucky. You still must speak out for your own safety and that of your loved ones and friends. I heard repeatedly from hospitals representatives in Maine Quality Forum meetings that their goal for MRSA infections is ZERO. If the offending hospitals continue with the inadequate screening, failing to isolate infected or colonized pateints, inadequate precautions, poor to moderate compliance with handwashing and rationing decolonization, this goal is unattainable. When these inadequate policies prevail and as a result the goal of ZERO is rendered unattainable, MRSA infections will continue, with a vengeance. MRSA thrives on poor technique and inadequate prevention. When you or your loved one gets infected with MRSA and are disabled or die because of it, get a lawyer. Better yet, network with other victims and pull together a class actions suit!! Someday, lawyers will take up this cause, unless hospitals smarten up first. The method is available to bring MRSA rates to ZERO. It is called Active Detection and Isolation. Maine Hospitals have chosen to ignore that scientifically proven method at this time. Litigation rather than legislation may be what motivates hospitals to STOP MRSA NOW!!! I must note here, that money is not my motivation. I am spending my husband’s pension and some of our savings on my advocacy work. I collect no salary, take no donations and I ask for nothing. All I want is safer hositals and ZERO MRSA infections. I believe that is a noble and honest goal. When my bill passed into law last spring, there was a stipulation that the Maine Quality Forum would “define” what populations were at high risk for MRSA in Maine, for the purposes of screening. This task was assigned to us by the Maine Health and Human Services Committee. I attended meetings for 5 months and I worked diligently between meetings researching this subject. I presented a solid list of known populations at risk for MRSA. I gathered this information from the CDC information and hundreds of other sources. I never attended a meeting uninformed or unprepared. I withstood stonewalling, dishonesty, reluctance and downright hostility in these meetings. I took verbal beating repeatedly and with grace. Without the refereeing of our leader and my dedicated Maine State Nurses Association collegue, my pursuit of safer hospitals in Maine would have been much more difficult. There is no doubt in my mind that they were trying their best to wear me down. They thought “she will go away afer a while”. Wow, they do not know me. The Maine Hospital Association and their associates, APIC (infection control professionals), and the MQF DO NOT WANT TO DO HIGH RISK SCREENING FOR THEIR PATIENTS. They will tell you they are already doing it, or it is too expensive, or it is too cumbersome, or there is no need because they are improving handwashing,….my goodness, I can’t begin to complete the list of excuses I have heard. The fact is that the MHA and APIC have lobbyists and money and they are fighting this effective approach to MRSA prevention tooth and nail. These associations and the MQF are the very people who should be making our hospitals safer. What this all really boils down to is that Hospitals and doctors do not want to be told what to do. Another thing they don’t want is to be liable for an excellent MRSA Prevention program. If patients have an increased expectation of hospitals and Active Detection and Isolation becomes standard practice in Maine, they will be held to it! This means increased litigation for MRSA victims if the hospital fails to meet the standards. Well, hells bells, why not? Maine Hospitals are responsible if patients become infected on their watch. They either improve safety or they are liable and there will be lawsuits! Maine hospitals think they are doing a bang up job with MRSA prevention. While I do recognize that some efforts are being made to stop MRSA, it is not nearly enough. Why just last week I talked with a woman who had over 100,000 dollars in medical bills after her hospital discharge . She got MRSA, C Diff, and pseudomonas during an over 100 day stay at the local hospital. She is still paying her bills off and she still suffers ill effects from those infections, but fortunately, she survived. Another person asked my son for my contact information because her father died 2 weeks ago with MRSA, same hospital. So, although they are doing SOME things to improve prevention, they are not stopping the infections. One reason for this is that their screening protocol is not wide enough, and that is likely the same problem in all the hospitals in Maine who are still seeing new infections regularly. Another reason is that they continue to room infected or colonized patients with uninfected pateints. I brought this up at the last MQF meeting and I got jumped on by 3 or 4 nurses all with similar excuses, including one that basically said that CDC says it is ok. This a recipe for disaster. Your local infection control nurse will tell you that “patients do not spread MRSA, hands do”. Yes, I agree, this is so. But contaminated instruments, uniforms, bathroom facilities and other environmental contamination also spreads disease, with the help of hands. And do not ever feel safe about the air you breath. MRSA can be coughed 3 to 4 feet when a patient has MRSA pneumonia. I have also read articles that air ventilation systems have tested positive for MRSA. So, without effective air filtration, MRSA can spread that way too. Another reason MRSA spreads is because doctors are rationing out treatment to interrupt colonization. They get to pick and choose the patients who will get this simple treatment before invasive procedures. The arguments for rationing is that there is some antibiotic resistance, or that MRSA can come back or any number of other excuses. The reality is that they are playing God in deciding who will have the advantage of simple decolonization ….if it will be you, or your neighbor or someone esle…. according to what procedure you are having. This seems unethical to me. If I am having a gut surgery and I have MRSA colonization, I want the treatment. I will take my chances at resistance or that it might come back after I heal. LET ME DECIDE my own fate. This witholding of effective treatment to prevent active infection smacks of the “Sarah Palin” death panel referrence. Not that I ever believed anything that Sarah Palin said. My guess is that if any of the doctors who participated in our MQF work group had MRSA colonization and needed surgery, they would be pushing the antibiotic ointment up their noses and scrubbing their bodies with Phisohex frantically and frequently before anybody touched them! There are many reasons that Maine hospitals are not stopping MRSA. These are just a few and they are the ones I have addressed in my legislative proposal. I would love to see an ambitious investigative writer start calling all of our hospitals. Their first question could be “how many patients in your hospital have MRSA now?” Second question, “how many of those patients came into the hospital with those infections?” Third question, “what is the prognosis for those patients?” How long will those patients suffer from these infections? “Is every MRSA colonized and infected patients isolated from other patients?” “How high is your handwashing compliance?” “Have your MRSA infections rate dropped or gone up in the past 10 years?” “Are you aware of the Veterans Administration MRSA screening program and it’s success in dropping MRSA Infections?” I want to do this investigation myself, but I have observed how close to the chest ANY MRSA information is guarded within these facilities. I sat in meetings with representatives from hospitals all over the State and I don’t know any of the answers to any of these questions. THIS IS THE BIGGEST DIRTIEST SECRET OF ALL IN MAINE HOSPITALS. And the secret is closely guarded. Each hospital’s representative in those meetings should have very proud CEOs. They didn’t spill the beans on any useful numbers for the MQF group. Two days ago, a unilateral and sudden decision was made by our MQF leader to do a “study”. This decision was made with no plan, no deadline, no consultant, and no requirements. After 5 months of pounding out a good solid list of high risk populations for screening, our work group’s direction changed. It was announced, not suggested. So, all of a sudden the MQF became a dictatorship, not a work group. While all of the logistics and details of this “study” are being worked out and the study done and the analysis made and resulting recommendations are decided, Maine patients at high risk for MRSA will continue to be admitted to our hospitals without screening. The expense of this test could be spent on a new effective screening program for all of our hospitals It is bogus and it is nothing but a stall tactic. The hospitals believe they have won a battle of some sort. If I thought for one minute that battle was against MRSA, I would not be writing this blog entry. It is a power battle they think they have won. MRSA prevention has little to do with it. MRSA screening saves lives and stops suffering. It is the first step in preventing MRSA infections. Patients with undetected MRSA will continue to be admitted to Maine hospitals, and be roomed with uninfected patients. Infections that can be prevented with simple decolonization treatment will continue to happen. Rates will not drop. And after a hospital allows this to happen to you, you will get the bill for the damages. You will be billed for care rendered as a result of a preventable infection. This study is a delay tactic. This allows Maine hospitals to stall the inevitability of effective high risk MRSA screening. This allows hospitals to continue doing exactly what they are doing now and that is not enough. I hold the MQF , the Maine Hospital association and Maine hospitals responsible for every single new MRSA infection that occurs in Maine hospitals while they are messing about with a study. This is not what was expected of us in our work group…….we need to start screening now…and without further delay. I will never give up this fight. It is much to important to everybody. My motivation comes from my grief and I will continue to grieve a long time for my special father who was infected by his trusted hospital and died as a result. The following press release was issued from Kathleen Sebelius, Secretary of DHHS, today. I wrote to Secretary Sebelius about 6 weeks ago to tell her about my father and his nightmare with MRSA. I took great care to include truthful and painful detail .She addressed my letter to her in this press release today. In this release, the Woman from Maine is me and the 83 year old man who died in January from Hospital Acquired MRSA was my Dad. Secretary Sebelius is listening. Anyone who has a similar horrible medical experience in their lives needs to let Secretary Sebelius know. She does read these stories from everyday citizens and responds to them. The part about my father is in the last third of this press release. 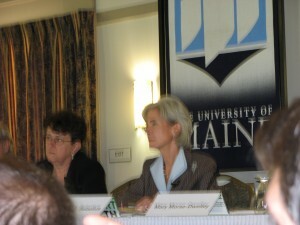 I was invited by Maine AARP to attend a meeting with Kathleen Sebelius with only about 50 other attendees. I represented the local AARP at this meeting. I was not called on to ask my carefully prepared question, but the discussion(in above photo) one on one was better. 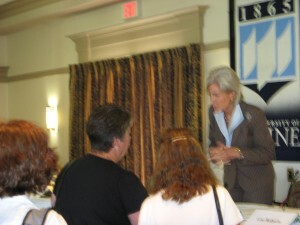 Secretary Sebelius is very well versed on healthcare reform. She told me about the stimulus money sent to all the States for enhanced infection control programs in hospitals. She said that MRSA and other medical errors are “definitely on the radar”. While she gave no specifics about MRSA, her sincerity and accessability makes me confident that MRSA and other hospital errors and infections will be addressed. Let’s just hope they will be addressed aggressively. For way too many years, infections have grown in types and numbers year after year. Without a reverse trend, what will happen? More death, suffering, disability. More anger and distrust in our Healthcare facilities. A wave of litigation from fed up victims and/ or their families. All of this is preventable with an aggressive mandatory approach to MRSA elimination. The stories I heard at today’s forum moved me tremendously. One of the panel members with a lengthy horribly terrifying story was a neighbor who lives about 6 houses away from me. I had no idea of her troubles. Mostly we heard about insurance, lack of or inadequate coverage, high deductibles or loss of benefits, and resulting financial ruin because of medical expenses. Every citizen in this country has a right to healthcare. Nobody should be sent home because they lack coverage if they have an illness or injury that requires hospitalization. But, Healthcare reform proposals must also address quality and patient safety. I hope I got that point across today.